At the end of a long school day (often largely spent sitting in the classroom), students are anxious to move! With the ClancyWorks ASPIRE Afterschool Dance Program, the learning continues as the movement begins! In the ASPIRE Dance Program, students learn multiple genres of dance including hip-hop, step, jazz, modern dance, Latin dance forms and creative movement/improvisation techniques. Each class focuses on the history, vocabulary, technique, and cultural context behind each form of dance. Every student gets a chance to showcase their own artistic voice by creating and sharing dance sequences created in small groups. The class fosters structured and supportive interactions with classmates, gives practice in problem solving, and builds academic as well as artistic skills. Additionally, the class highlights the importance of teamwork, collaboration, and positive group interactions through group and partner work. 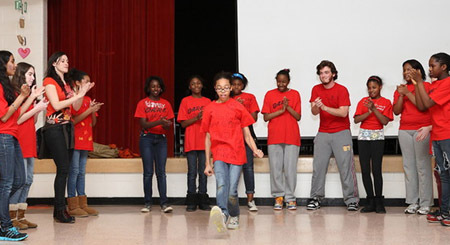 Students in the ASPIRE Afterschool Dance Program have the opportunity to perform in an informal presentation showcasing the knowledge gained during the classes for their peers, teachers, family, and the greater community! We tailor each program to meet the specific needs of each school. Contact us to learn more about the variety of options to individualize the ASPIRE Program to your school’s needs. The ClancyWorks ASPIRE format is also used in our residency and arts integration programs. Contact us today to arrange an afterschool dance program, led by ClancyWorks professional dancers and using our highly acclaimed ASPIRE program, for your students today! ClancyWorks staff can help your school apply for grants and funding to make this program possible.